Over the last decade, interventional cardiologists have globally made tremendous progress in understanding and overcoming conditions associated with chronically occluded coronary arteries. 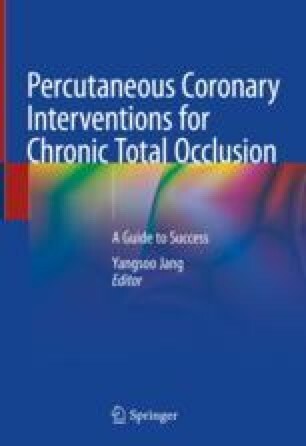 Percutaneous coronary intervention (PCI) of chronic total occlusions (CTO) is a rapidly evolving field. The initial success rate is increasing with the improvements in technology and technique such as the retrograde approach . Recently, antegrade dissection and reentry (ADR) for CTO PCI has also evolved to one of the techniques, especially in USA and Europe . Although there are several ADR techniques including subintimal tracking and reentry (STAR) or the limited antegrade subintimal tracking (LAST) technique, recent ADR can be achieved with the CrossBoss catheter (Boston Scientific, Nattick, Massachusetts) and the Stingray system (Boston Scientific) . In this section, we describe about the CrossBoss and Stingray system designed for CTO crossing and reentry. Maeremans J, Dens J, Spratt JC, Bagnall AJ, Stuijfzand W, Nap A, Agostoni P, Wilson W, Hanratty CG, Wilson S, Faurie B, Avran A, Bressollette E, Egred M, Knaapen P, Walsh S, Investigators RECHARGE. Antegrade dissection and reentry as part of the hybrid chronic total occlusion revascularization strategy: a subanalysis of the RECHARGE Registry (Registry of CrossBoss and hybrid procedures in France, the Netherlands, Belgium and United Kingdom). Circ Cardiovasc Interv. 2017;10(6) https://doi.org/10.1161/CIRCINTERVENTIONS.116.004791.